Edwin Lawrence was a pioneer in Michigan before it was a state, and one of only six lawyers in Washtenaw County in 1832. Lawrence was apparently born in 1808, in Washtenaw County, but no other information is readily available on his early life. He moved into Washtenaw County in 1832, settled in Ann Arbor, and lived there for the rest of his life. Lawrence practiced law for about thirteen years before becoming Circuit Judge for the district encompassing Washtenaw County. 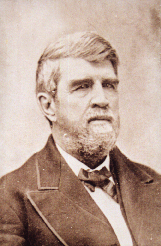 In May of 1857 he was appointed by Governor Bingham to the Michigan Supreme Court seat formerly held by David Johnson, who had resigned. He served the remainder of the year, and then returned to Ann Arbor to take up the general practice of law. Lawrence enjoyed a highly successful professional career and a very favorable reputation in the community, which brought him the appointment or election to local public offices. In 1874 he retired from active legal life, having been in partnership during the last year with A.J. Sawyer.